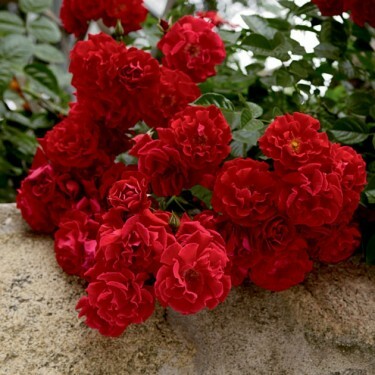 When it comes to bright glowing red Groundcover roses, this one's hard to beat. Nicely-sized showy flowers come in large clusters to drape over a wall or spill from a container. Better yet, that awesome colour holds on until the very end. Clean doubly-dark glossy green leaves round out the display on this super vigorous gem. Groundcovers are Shrub roses with more spreading habits and good disease resistance that can be utilized in the landscape to achieve low growing mass plantings.